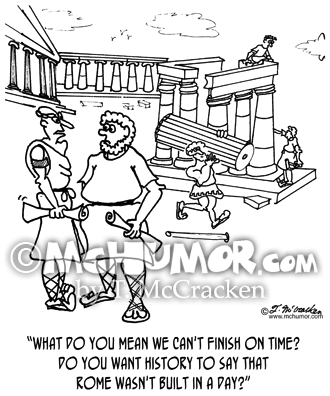 Rome Cartoon 2423: A Roman contractor says to another, "What do you mean we can't finish on time? Do you want history to say that Rome wasn't built in a day?" 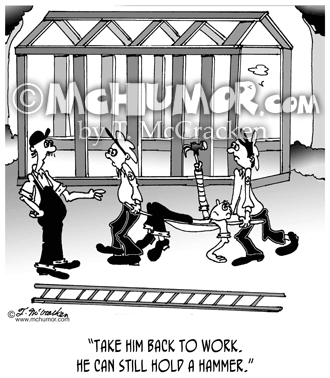 Carpentry Cartoon 6413: A man being carried away on a stretcher with a hammer stuck in his bandaged arm that is erect. His foreman says, "Take him back to work. He can still hold a hammer." 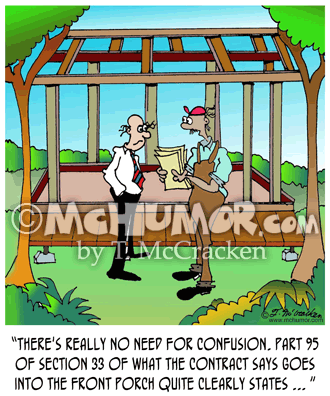 Contracting Cartoon 7384: A customer looking through a huge contract saying to a builder, "There's really no need for confusion. 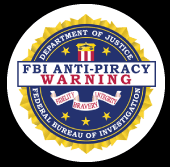 Part 95 of section 33 of what the contract says goes into the front porch quite clearly states ... "
Contracting Cartoon 6121: A job site where everything is falling over or askew an older man saying to a jittery younger one, "Don't worry, the first 30 years of contracting are the hardest." 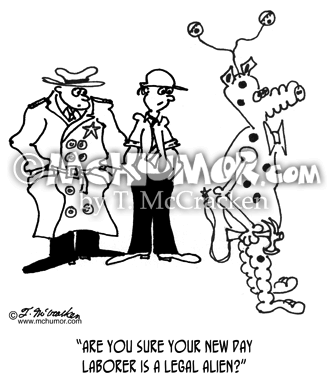 Contracting Cartoon 6313: A contractor looking at "The Contract", a one page document. 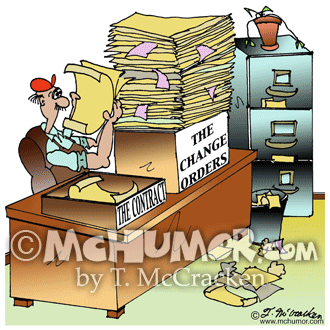 "The Change Orders" is a stack of paper several feet high. 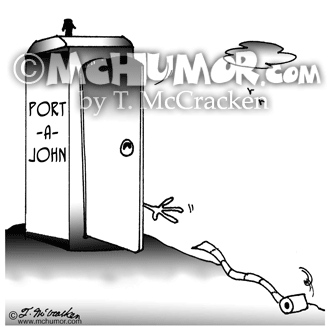 Construction Cartoon 6454: A hand from a Port-a-John desperately reaching for a roll of toilet paper has it rolls away. 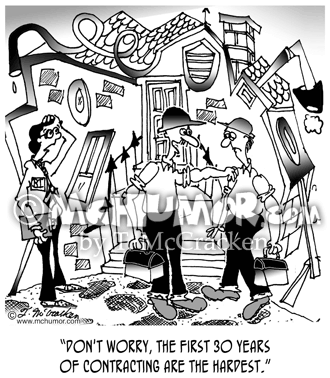 Construction Cartoon 6085: On a job site a government inspector looking at a space alien he says, "Are you sure your new day laborer is a legal alien?" 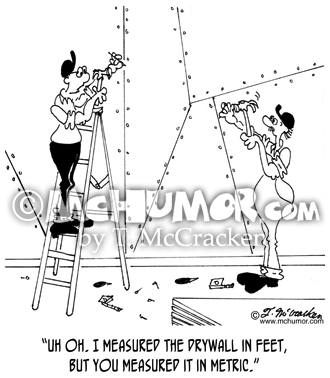 Drywall Cartoon 7032: Looking at uneven edges of wall a carpenter says to his partner, "Uh oh. 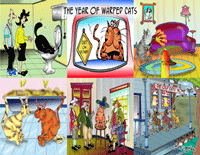 I measured the drywall in feet, but you measured it in metric." 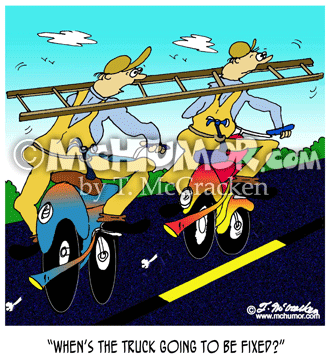 Carpentry Cartoon 6875: Two carpenters on a motorcycle with their ladder over their necks. One asks, "When's the truck going to be fixed?"